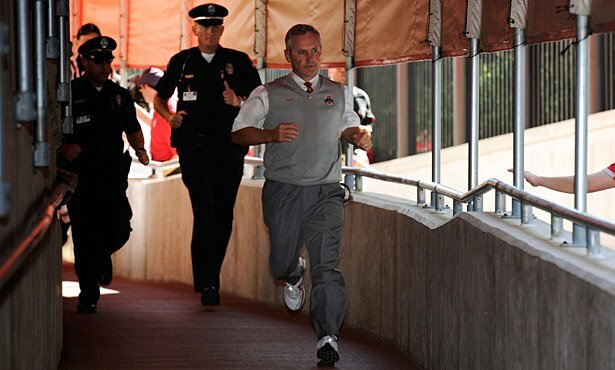 • Tressel was guilty of ethical misconduct when he knowingly provided false information to the NCAA in certifying that he knew of no potential violations by his players and failed to inform OSU officials. • Ohio State fielded ineligible players last season when starting quarterback Terrelle Pryor and others competed despite Tressel's knowledge of their misconduct. NCAA bylaws call for immediate suspensions. The NCAA warned that it could treat Ohio State as a repeat offender stemming from the violations involving former quarterback Troy Smith, who took $500 from a booster and former men's basketball coach Jim O'Brien, who gave $6,000 to a recruit. That finding is the most damning and potentially most damaging because repeat offenders face post-season bans, the entire coaching staff could be suspended and the school could lose scholarships, according to NCAA rules. "It was reported that Jim Tressel, head football coach, failed to deport himself in accordance with the honesty and integrity normally associated with the conduct and administration of intercollegiate athletics and violated ethical-conduct legislation," the 13-page NCAA document says. The allegation that Tressel lied to the NCAA is significant. Since 2006, the NCAA has sanctioned 28 schools for violating the ethics bylaw that Tressel did. Of the 13 head coaches involved, only one kept her job. The others either resigned or were fired by their schools. Since 2004, four universities that are part of the Football Bowl Championship division were penalized by the NCAA for allowing ineligible players to participate in games and for being repeat offenders. Alabama (football), South Alabama (men's tennis), Arkansas (track) and Southern California (football) each had to vacate all victories in which the ineligible athletes competed. All were placed on probation, but only Southern California was banned from post-season competition. The article goes on from there to discuss the next step in the process is a August 12th meeting between Tressel, Gee, Gene Smith and the NCAA rules committee where tOSU will be forces to explain itself and respond to this "notice of allegations". I doubt we'll see tOSU fire/ask to resign Tressel before the season. But I would be shocked if he was the head coach for 2012.